Fetch the Paper? Play Dead? Can You Train Your Cat? Kristen Levine is a pet living expert, author and pet rescue advocate. She firmly believes we need pets as much as they need us, and thus founded the Kristen Levine Pet Living blog, where she shows us how to live happier, healthier lives through pets. Kristen lives in Florida with her husband, dog (Chilly), two cats (Olivia and Turtle) and two miniature donkeys. Usually, when you hear someone talking about training a pet, a dog is the first thing that comes to mind. But why should dogs and dog parents have all the fun? Cats are certainly more than capable of learning a trick or two, right? When you stop to think about it, we have already done a little bit of training with our kitties. 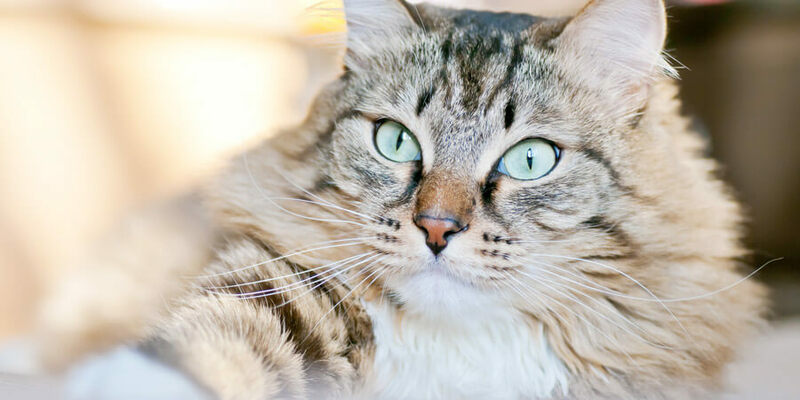 If your cat uses a litter box, scratches a scratching post instead of your favorite chair, or comes running when she hears the treats come out, these are all things that you’ve trained her to do! But you don’t have to stop there. 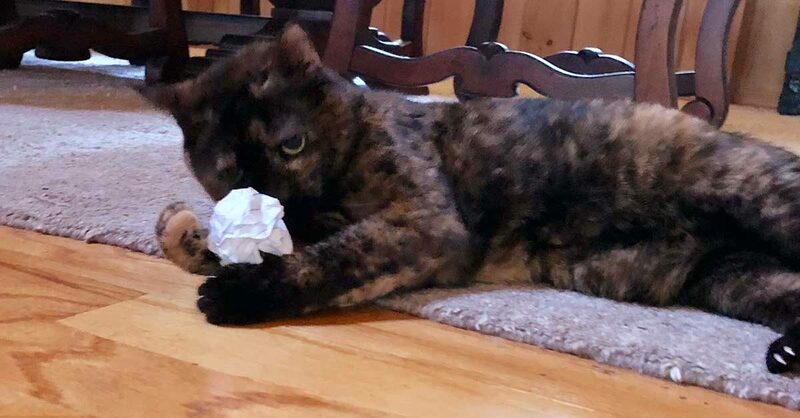 My cat, Turtle, loves to chase balled up paper. Sometimes she’ll even fetch a ball that we throw for her. I didn’t actually train her to do this – I think it’s her way of training us to play with her! But watching her do this makes me think that I could probably train her to do other fun tricks. 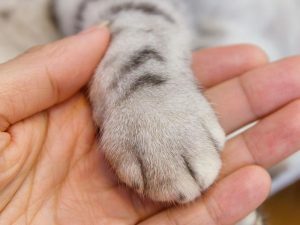 Cats can learn to do all kinds of things, from coming when called, to begging, to giving a high five! 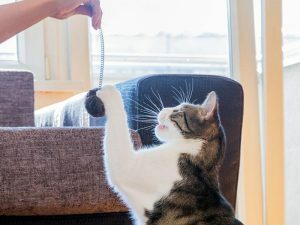 If you’re thinking of trying your paw at training your cat to do a few tricks, here are a few tips that can help. 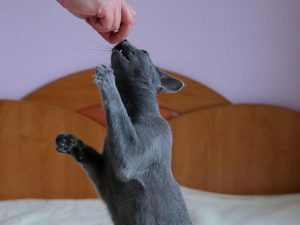 For most felines, the best way to encourage good behavior is to reward her with yummy treats. This is where you want to pull out all the stops. Don’t just offer a bit of dry kibble. Find something she rarely gets and will go crazy for. Treats that will entice many kitties to perform include diced chicken or bits of low-sodium tuna. Some commercial cat treats may also work if she finds them irresistible. Some cat parents have found that using a clicker along with treats helps their kitty to understand exactly what behavior is being rewarded. It’s probably a good idea to start simple. 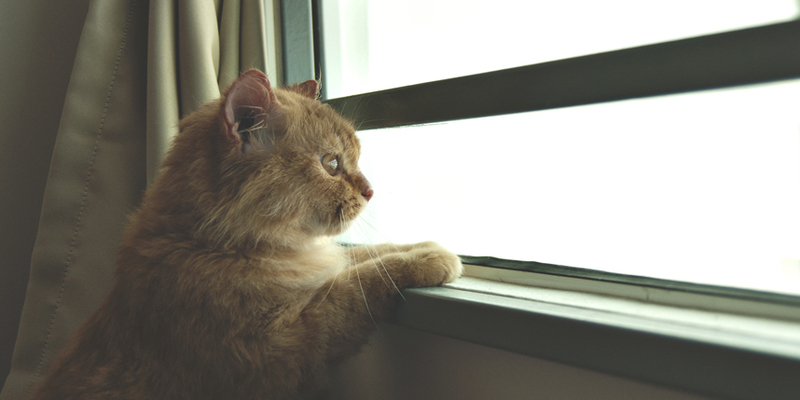 Especially at first, it may be easier for your cat to learn something that’s a natural behavior. Tricks like coming when you call her, sitting, or raising a paw are fairly easy to encourage and reward. Once she’s mastered a few simple tricks, then feel free to try something a little more challenging! To help you get started, here’s a cat training video with veterinary behaviorist, E’Lise Christensen, Veterinary Behavior Consultations of NYC. Always reward the desired behavior, but never scold if she does the wrong thing. 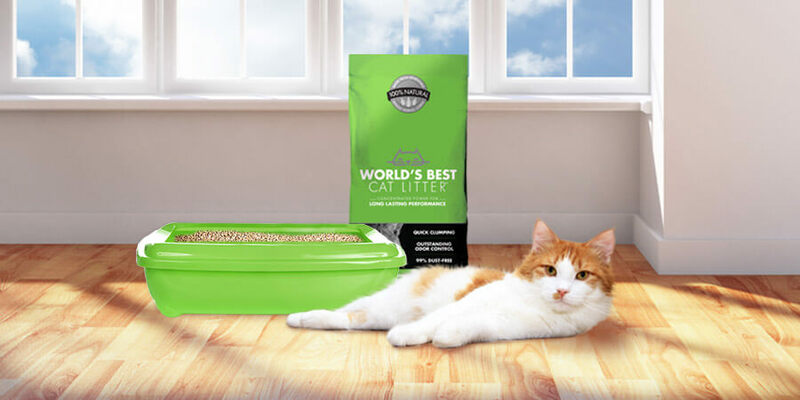 You want your feline friend to enjoy your training sessions. She needs to associate them with good things. If training sessions cause her stress, she won’t want to learn. And if you’ve ever tried to convince a cat to do something she doesn’t want to do, you know it’s nearly im-paw-sible (sorry, I’m on a pun kick today)! Practice is important, but don’t overdo it! Just because we humans tend to wear ourselves out when we’re learning a new skill doesn’t mean that’s the best way to train our cats. You’ll want to practice a few times a day, but keep your sessions short! Otherwise, kitty will get bored and you’ll have your hands full trying to convince her to participate in the future. It’s also important not to teach your cat too many tricks at once. Give your cat time to master each trick before you move on to a new one. With a little creativity and a lot of patience, you may be amazed at what your favorite feline can learn. Training your cat can be fun, but there are other benefits too. Learning tricks is great exercise and mental stimulation for your cat, and the time you’ll spend together will be a special bonding experience for both of you.